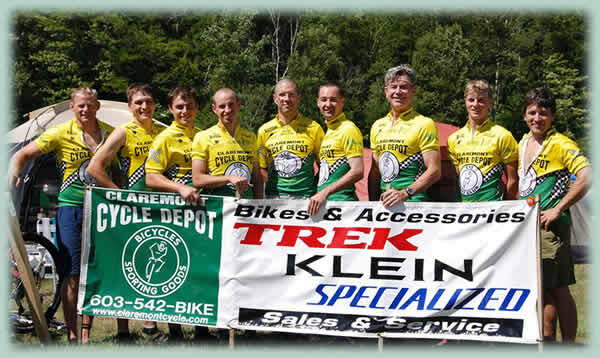 Team Pinnacle is a group of cyclists, and outdoor enthusiasts from the Newport, New Hampshire region. We have created and maintain miles of mountain bike trails. We ride on and off road, for fun and for competition. Cross country mountain bike races, 24 hour races, Ironman triathlon, sprint triathlons, adventure races, and charity rides are just some of the activities Team Pinnacle members have done in the past. In addition to what individual members do, the team also promotes several events each year including "The Pinnacle" cross country mtb race, the "Six in the Stix " trail run race, the "Pinnacle Challenge" multi-sport adventure race, and the "Davis Hemingway Memorial Century" road bike race. Proceeds from all of the events go to local charities. Every Wednesday during the summer we host an evening ride in the Newport region. All are welcome to join us, check the message board, give us a call or send us an e-mail to find out the details of our next ride. Welcome to Team-Pinnacle.org, enjoy the website.